Today, tea-leaves are harvested by hand or by machine. 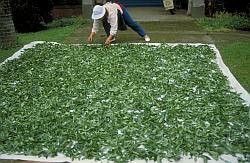 Picking by hand is the recommended method of harvesting premium, superior grade leaves. Before, tea planters harvested the tea leaves with the use of the index finger and thumb to clamp the stem and broke the leaves off quickly. Today,however, many farmers have used more time- savingand less labor-intensive methods of snipping the stem with the use of an attached blade to the index finger. Leaves are harvested mostly as young leaves and as buds. It is highly critical to preserve the leaf’s surface to the product’s quality so much care is given during harvesting not to cause the leaves any damage . After picking, leaves are placed in baskets made of bamboo and driedout in the sun or with a machine blowing hot air to remove moisture and oxidize the leaves. When the baskets are placed indoors for drying, the leaves are carefully stirred and so that their cells are aired which assists in their fermentation. Referred to as “waving of the leaves”, this can also be done with the use of a machine. Fermentation is the process when moisture is removed from the leaves and their cells get air. If the moisture is lost too quickly without sufficient fermentation, the cells will dehydrate and die and the tea produced will be useless. Too much stirring of the leaves after they have lost moisture from their edges will also turn the leaves red and prevent the cells from releasing moisture to finish the process of fermentation. The tea produced will be bitter in taste and appear bloated. Preservation of the leaves is crucial because scarring or breaking the leaves will produce inferior tea as it impacts the fermentation process. 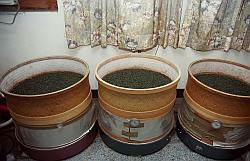 To stop fermentation, the tea leaves have to be steamed or fried in a pan—to “kill” or “steam” the leaves. This process removes the leaves’ odor. The stem and veins of the leaves also become more flexible and a little sticky as moisture is removed from the leaves, making them less likely to break in the next procedure. Fired leaves are placed in rollers to facilitate steeping when the leaves slowly curl and tighten up as they are stirred around. 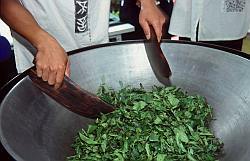 Sapproduced by this process sticks to the leaves andis dissolved rapidly in the boiled water , producing aromatic tea. Various tea types would need different amounts of kneading. Pouchong tea gets its shape from an added kneading step as a cloth is wrapped around the leaves like a ball and pressed by hand or by machine. During this step, the cloth has to be unrolled from time to time , spread out the leaves so that heat is then released and this procedure is repeated many times. The more often this is done, the more the resulting product will be tightly wrapped. In order tototally stop the leaves from further fermenting and decrease volume so that it is easy to store, the kneaded leaves are driedwith a machine, using very high heat to “kill” enzymes and decrease moisture content to below 5%. 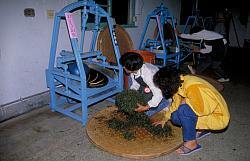 The leaves are then arranged , spread on trays, and put inside a dryer. To ensure complete drying, the leaves are dried twice as drying is accomplished between 70-80% during the first drying and then the leaves are taken out of the dryer and left to cool. Once cool, they are dried again. 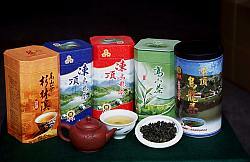 Dried leaves are called “rough or base tea”. Refining is a crucial step in the processing of tea. During this procedure, thetea-leaves are classified according to size as appearance is an important consideration when consumers buy their tea and measures are taken to make sure that the taste is never compromised. Leaves that are too large are cut up to the ideal size, unnecessary parts like stems are also removed and their shapes are accentuated by machine for reshaping. Any loose powder that results from this procedure is also removed to ensure that leaves produced are of superior grade. Slow roasting of Refined leaves is done to release their original scent. Depending on the leaf variety, a little roasting (raw tea), medium-level roasting (raw-ripe tea) and excessive roasting (ripe tea) are used. “Raw tea” smells of a rich scent and makes a light-colored liquid. “Ripe tea” is not as fragrantcompared to raw tea but its taste is also unique. Jasmine tea, which has always been popular among tea drinkers, is a perfect example of oriental tea with floral scent. Not all tea types are scented but the most usual floral scents include jasmine, osmanthus, chrysanthemums which are picked while in full bloom. Infusion is used to give the leaves the selected floral scent and the procedure can be repeated as much as three times for maximum effect.